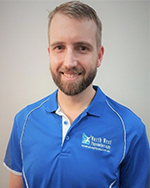 Ben is the Director and Principal Physiotherapist at North West Physiotherapy Eatons Hill. He started out at the Everton Park clinic in 2010 and now brings to Eatons Hill over 10 years of clinical experience. During his 7 years at the Everton Park clinic, Ben developed his passion for the field and dedicated his time to building his skill set to allow effective treatment for all patient needs. In 2017, Ben and Roger McIntosh (Founder, North West Physiotherapy Group) opened the third North West Physiotherapy clinic together at Eatons Hill. Ben brought with him the core values of the North West Physiotherapy Group in providing high-quality, personalised treatment for a diverse range of patients. Ben has further training in: Dry Needling, Shoulder Rehabilitation and Hip/Sacroiliac Dysfunction. Ben is also a qualified “Bounce Back” instructor and helps people with both acute and chronic back pain to return to previous fitness and maintain long term results. Also experienced in Sports Rehabilitation, and getting injured athletes back on the field, Ben has worked outside the practice with several high-level football teams in Brisbane including; Eastern Suburbs Football Club and Mitchelton Football Club. Outside of work Ben enjoys cycling, catching up on sports highlights and chasing after his children. Ben does not run any classes at this time.